GRECE – Eros - An exhibition examining the changing image of Eros from Antiquity to Renaissance is on show since January at the Metropolitan Museum of Art. The exhibition revolves around one of its most remarkable possessions, the “Sleeping Eros,” a life-size bronze, winged little boy made by an unknown Greek sculptor in the third or second century B.C. Eros, the Greek god of love, was capable of overpowering the minds of all gods and mortals. According to an early myth, Gaia (goddess of the Earth) and Eros were the source of all creation. Literary references of the sixth and fifth centuries B.C. often portray Eros as a cruel, capricious being who causes burning desire. In Classical art he is usually represented as a beautiful winged youth. During the Hellenistic period (323–31 B.C.) a new image of the god as a baby took hold. The popularity of that iconography is linked to the myth of Eros being the son of Aphrodite, born of her affair with Ares (god of war). The most innovative and influential representation of Eros during the Hellenistic and the Roman periods was of Eros sleeping. The Metropolitan’s bronze statue Sleeping Eros is the finest example of its kind. Scholars have long wondered whether it is an original Hellenistic work or a very fine Roman Imperial copy. Variations of the type are known from hundreds of sculptures, which, to judge from the number of extant replicas and adaptations, was one of the most popular ever produced in Roman Imperial times. It was also among the earliest of the ancient statues rediscovered during the Renaissance, when artists revisited the theme. This exhibition presents the results of a recent study of the Museum’s statue, utilizing scientific and technical analyses as well as art-historical research, which supports its identification as a Hellenistic bronze but one that was restored in antiquity, likely during the Roman Imperial period. USA – Alice - Archaeologists have found human bones at the site of the new multi-use complex being built in Alice, and project leaders believe they may have found an ancient burial ground. 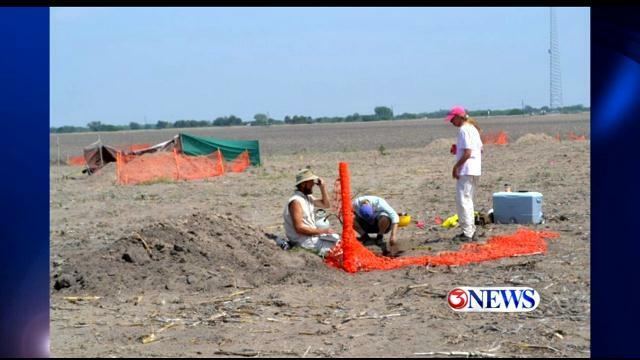 The bones were found April 3 by archeologists who were doing a survey of the location. They have since been removed from the location and are being protected by an archeologist. The archeologist said he does not know how old the bones are, and he doesn't even know how old the site is. Archeologists have also found some spearheads and arrowheads at the site. "It was very lucky where we found them, and it did not require us to have to move buildings or any of the proposed improvements," said John Michael of Naismith Engineering. "It was actually located in what was going to be a park setting between the aquatic center and a lake that we're building down there."